Punarnava is one of the world's great herbs and one of my favorites. Definite superstar status. Most people have never heard of Punarnava (Boerhaavia diffusa), much less used it, even though it is one of the best health promoting herbs in the world! Not exactly a household name. But it's relative obscurity doesn't take away from its supurb qualties. In Ayurvedic medicine from India, one of the oldest medical systems in the world, Punarnava is very highly regarded and is considered to have 'significant rejuvenative actions,' a Rasayana (see sidebar). Even its name suggests how important it is. Punarnava is derived from two different words: 'punar', which means 'again' and 'nava' meaning 'new.' The literal translation is 'one that renews.' So true to its name, it is mainly used to renew body systems. But Punarnava has incredibly diverse properties, as you will see. I use Punarnava in our Cleanse and Restore formula because of it's whole body cleansing and rejuvenative properties. One of the best. Punarnava assists the body in so many ways that it is one of the top herbs found anywhere and is indespensable for its cleansing properties and ability to help restore health. You need a strong, healthy liver to deal with the abundant cleansing and detoxification needs ot modern life, which definitely puts it to the test. Our own Environmental Protection Agency (EPA), tells us that the average American holds more than 700 toxic chemicals in the body that we inhale, ingest, or consume in one way or another. Under this kind of assult, its pretty clear that supporting the liver is vital. Punarnava helps protect, support and restore a sluggish and overworked liver that ultimately leads to restored strength and vitality. 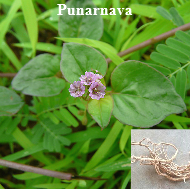 Punarnava is also used to support the gallbladder, kidneys, and is considered a premier blood cleanser. It is used as a digestive aid, is mildly laxative, helps remove mucous, is a mild diuretic, supports the adrenals, and possesses anti-cancer as well as anti-inflammatory properties. Now you know why I consider it a superstar. We also use Punarnava in the Max ParaCleanse formula for the very same reason as well as a few other reasons. First, it's an anti-parasitic in its own right. But it's cleansing and restorative properties makes it indespensable. In South America, Punarnava, or Erva Tostao, as it is called there, is used to rejuvenate, protect and detoxify the liver, which is useful at any time, but especially during a parasite cleanse. Not only does the liver harbor flukes, but when the body is attacked by parasites anywhere in the body, or infections in general, it puts a lot of stress on the body. Especially the liver. The result is fatigue, lethargy and a compromised immune system and compromised health in general. But the primary reason it is in the Max ParaCleanse formula is because of its premier cleansing, tonic and support properties. If not THE best multi-purpose herb, one of the best. When doing a parasite cleanse, you absolutely must support the body, and Punarnava does just that at the highest level. All herbs have multi-functions and Punarnava is no exception. It is one of the main characteristics of herbs in general and is one of the reasons that makes herbal remedies so valuable. They don't work like pharmaceutical medicines, nor would you want them to. So when you are considering options for building your health, punarnava is an herbal superstar that warrents your attention. For Cleanse and Restore Formula, go here. 'Path (ayana) of Essence (rasa),' that which enters the essence. Punarnava is designated a Rasayana. It is a very high designation for any herb or formula that serves to promote health and longevity at the highest level in Ayurvedic medicine.